As this blog approaches it’s ends I need to acknowledge the many people who have made it possible. 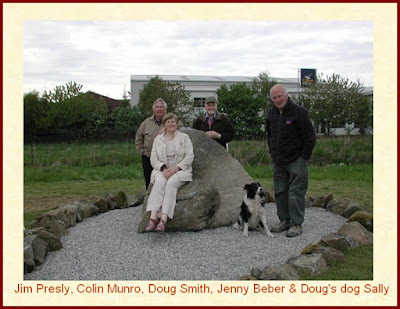 Firstly, a big thank you goes to the Meldrum and Bourtie Heritage Society (MBHS), who’s work on the Battle of Barra 700th anniversary memorial, forms a large part of this blog. 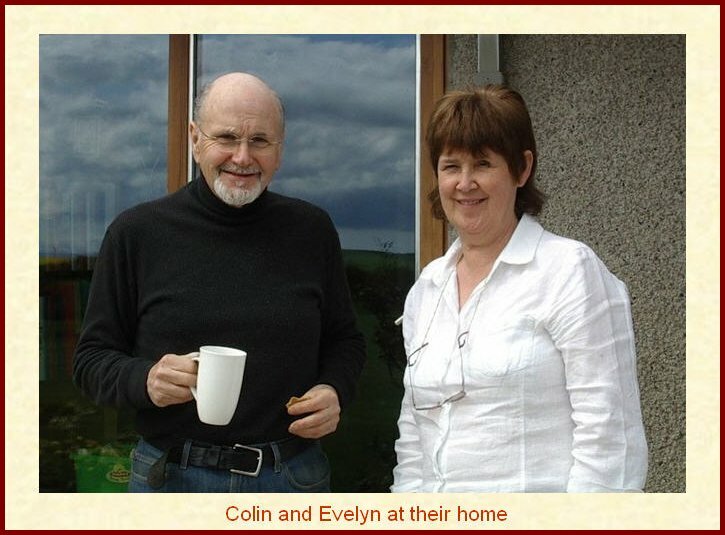 I would like to especially thank Evelyn Munro, for providing pictures and feedback on the progress of the memorial and coordinating with others to gather information on various subjects. 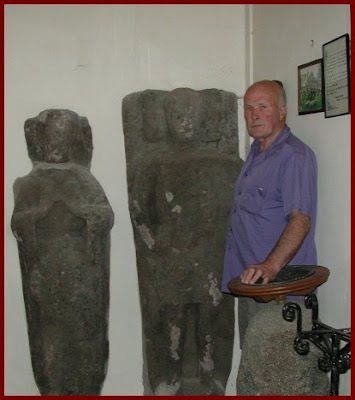 John Pirie was instrumental is providing information on the original location of Bruce’s seat and locating it in the rock pile where it lay for over half a century. Also, for his work on the memorial. Doug Smith for his work on the memorial and for providing details of the moving of Sir Thomas and his lady from the kirk yard to its current location in Bourtie Kirk. Rev. Hugh O’ Brien, of Meldrum and Bourtie parish, for taking the time to open the church for me and allowing me to take pictures of Sir Thomas. Rachel Ann Dressler who provided information on the possible dating of Sir Thomas and his lady. Bob Forsyth who provide the details of the Battle of Barra float, in the 1954 Meldrum sports. 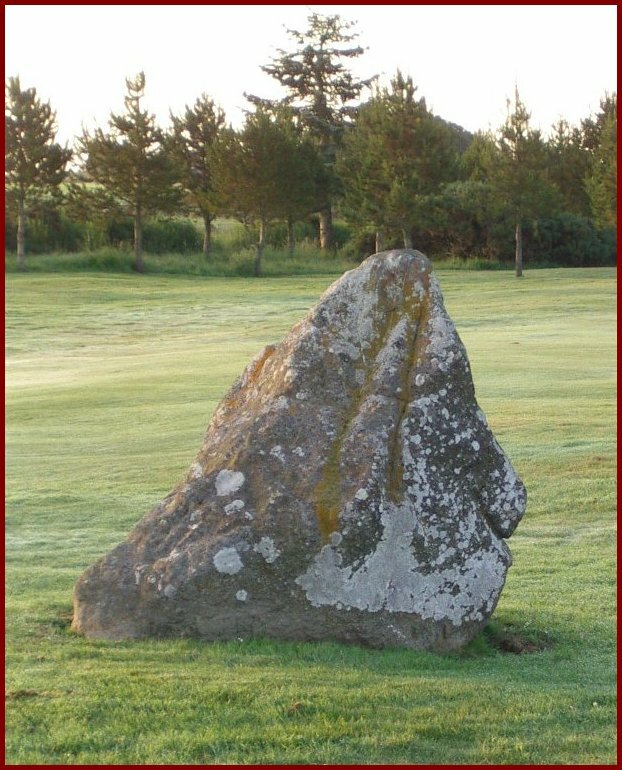 Moira Gregg for her Scottish Field article on the battle and providing the picture of Wallace’s putting stone. 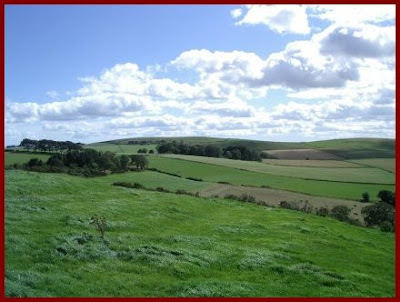 “Dowsing for Patterns of the Past – The Stone Circles of Aberdeenshire”. Anne Burgess – Elgin Castle. Chris Lodge – Aikey Brae Stone Circle. Keith Kaase - Bust of Robert I. 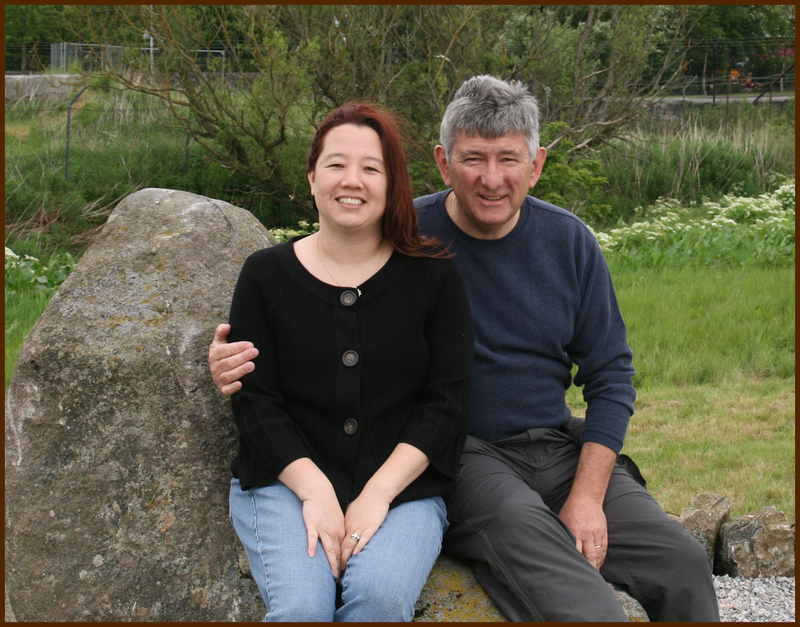 Finally a thank you to my wife Juliet who offered encouragement and support and consented to be dragged around various sites, as I sought information or photographs, when we were supposed to be on vacation. Juliet and Jim on Bruce's seat. The Battle of Barra has tended to be a footnote in history, viewed as one small step on the road to Bannockburn and ultimately independence, but I would contend that is was a pivotal event in achieving Scottish independence. Prior to the 1307 campaign the Bruce cause was in tatters and no one could realistically expect him to succeed, and although his fortunes improved during 1307, there were still several Scottish enemies who could probably individually destroy his small force. 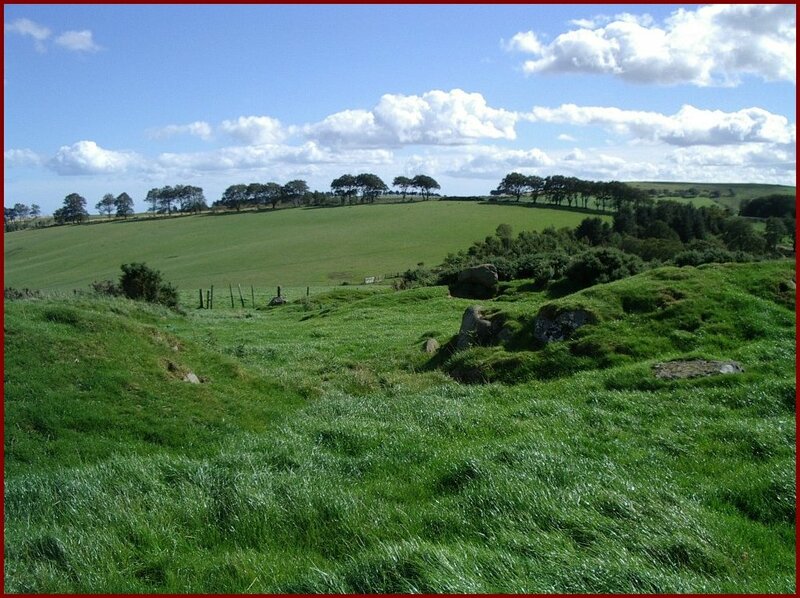 With victory at Barra, he defeated the strongest of his Scottish enemies and went on to destroy the Comyn powerbase in NE Scotland. Following this success, he went on to destroy or neutralize his Scottish enemies, and within a year no Scottish magnate had the power to resist him without English support. Shortly after Barra, he captured Aberdeen and its port which offered him access to Europe. It was for several years the only major European trading port held by Bruce. (Dundee 1312; Perth 1312; Leith 1314; Berwick 1318). During these years Aberdeen would operate as a base for commerce raiding (basically piracy) and trade with Europe. Although there was still a long and dangerous path to Scottish independence, after the victory at Barra things would never be so perilous as they were in 1306/7. There is nothing visible today which can be directly linked to the battle, and the actual site is a matter of conjecture, however that does not mean that there is nothing to see. 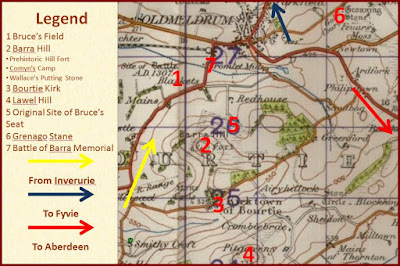 With that in mind, I would like to highlight seven locations which may be of interest and have featured in the blog. 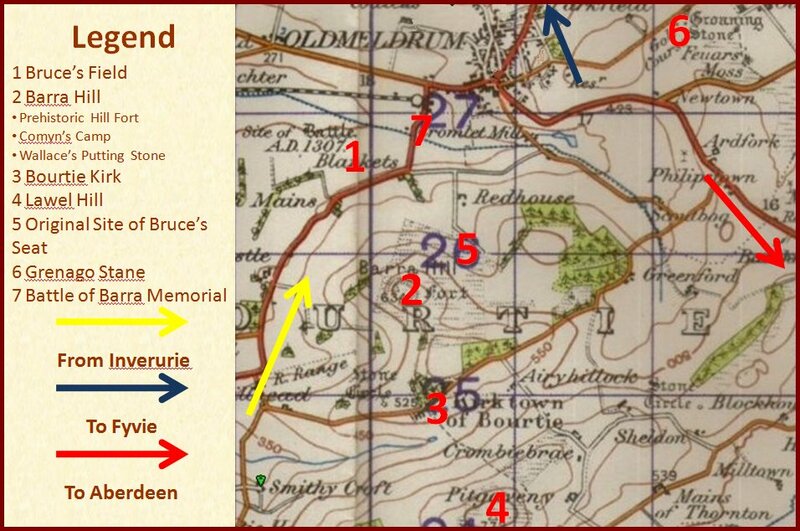 1: Bruce’s Field is by tradition the site of the battle, it is located to the left of the main Inverurie to Oldmeldrum road (B1970), when travelling towards Oldmeldrum. The entrance to the footpath from the Oldmeldrum end. 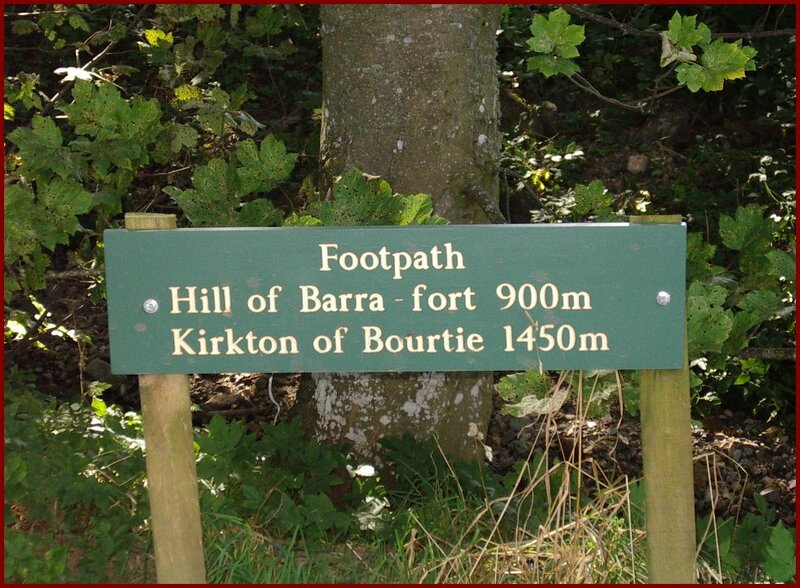 2: Barra Hill, is the location of three places of interest, which can be reached by the footpath. A: The Iron Age hill fort which predates the battle by over a millennium. 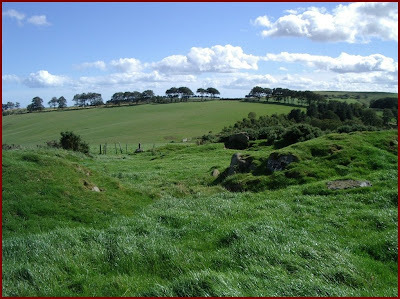 B: Comyn’s camp, which is the same location as the hill fort, is by some traditions where the Earl and his army camped the night before the battle. However, there is no evidence to support these traditions. 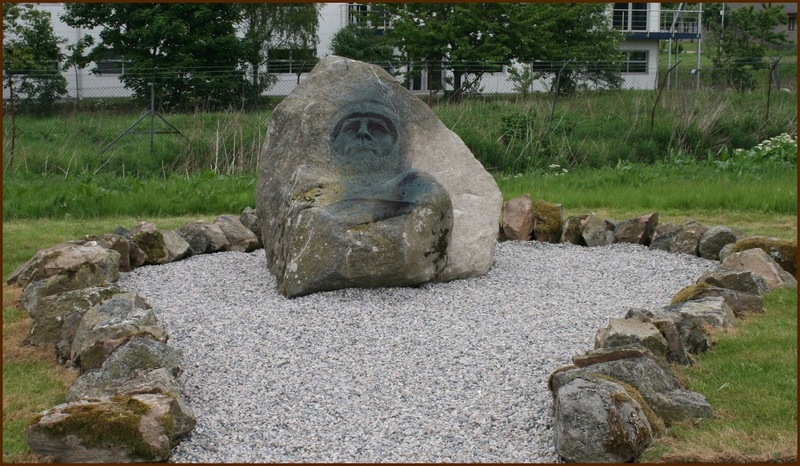 C: Wallace’s putting stone, is a large serpentine rock standing on Barra hill, which according to legend was thrown by Wallace from Bennachie, into Comyn’s camp to aid the king’s army. 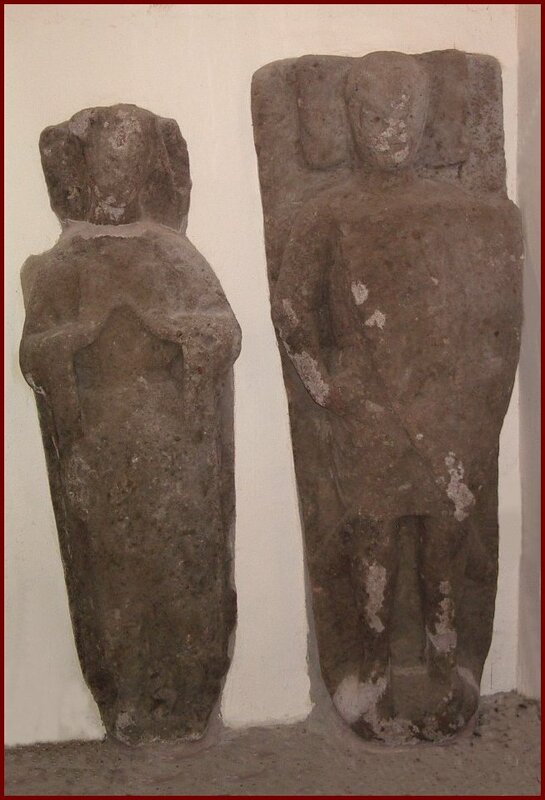 3: Bourtie Kirk is the location of two stone figures, a knight and a lady, who are associated with the legend of Thomas De Longueville. Legend has it that Sir Thomas a companion of Robert I, was mortally wounded, and in true Robin Hood fashion fired an arrow, to determine where he should be buried. Lawel hill is located to the south of Barra Hill and can be viewed for the summit. 5: The original site of Bruce’s seat, was just off the old footpath which ran up the eastern slope of Barra Hill. For details of the location and see John Pirie’s account. 6: The Grenago Stane, is located on the 14th fairway of Oldmeldrum golf course. 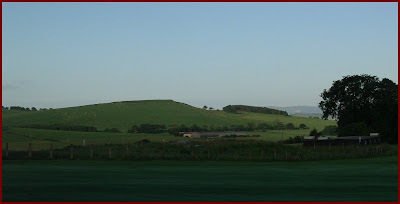 It can be viewed from Kirk Brae, just take care to avoid flying golf balls. 7: Battle of Barra Memorial, was unveiled ten years ago, and details of the project are included in numerous posts on this blog. 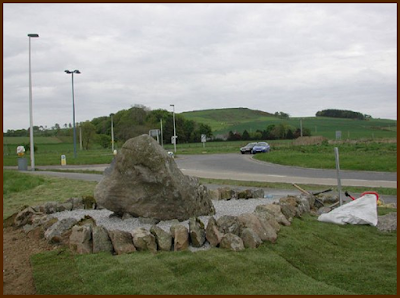 It is located on the north side of the Barra roundabout, on the B9170. The battle field today is described in the “inventory boundary” and “battlefield landscape” sections of the Historic Scotland battlefield inventory. One last thing, if you are visiting any of the locations, please treat them with respect. In the coming years this dominance would be challenged by rivals, but the Comyn party would work together to thwart the efforts of their various challengers. 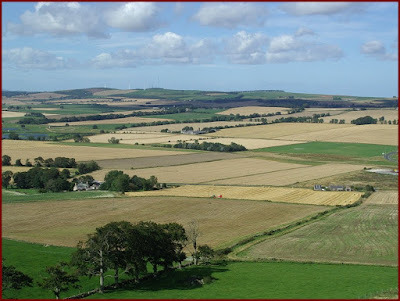 When William the Earl of Buchan died in 1233, his son Walter, Earl of Mentieth and Lord of Badenoch, assumed the leadership and confronted the challenge from their north eastern neighbors, the Bissets and the Durwards. The suspicious death of Patrick of Atholl in 1242, was the opportunity the Comyns needed to attack their Bisset challengers who had been gaining more influence with the King (Alexander II). Walter and John Bisset were implicated in the death and the Comyns, with the support of other nobles achieved the exile of the pair. Fleeing to England the Bissets encouraged the interference of Henry III in the affairs of Scotland, an unfortunate reality accepted by most in Scotland, but which would lead to disaster before the end of the century. At the close of the reign of Alexander II, the Durwards rose to be the principle advisers to the king, and on his sudden death they retained control during the minority of Alexander III. The Comyns seized the young king and his queen taking control of the government, forcing out the Durwards. The Durwards sought Henry’s assistance, and again all were forced to accept his intervention. (It should be noted that Alexanders queen was Henry’s daughter, and he did have genuine concerns for her safety). This is the period in which the later chroniclers paint the Comyns as “over mighty subjects”, but they were by then partisan Bruce/Stewart spin-doctors, and sought to unfairly discredit the Comyns. For the remainder of Alexander III’s reign the Comyns were prominent in the affairs of the realm, and on his untimely death were instrumental in stabilizing the situation and provided two of the Guardians of the realm during the first interregnum. (John II of Badenoch and Alexander Earl of Buchan). However, the Comyns also had a weak claim to the throne through Richard Comyn’s marriage to Hextilda, the daughter of king Donald Ban. John II of Badenoch also had a claim to the throne due to his marriage to Eleanor the sister of John Balliol, but that claim would always be subservient to that of John Balliol and his descendants. Edward ruled in favor of John Balliol who became King of Scots, but Edward’s heavy-handed approach eventually lead to war. The Comyns would consistently support the Scottish side during the war and John Comyn III, co-led the Scottish victory at Roslin in 1303, but about a year later the Comyns and the other Scottish magnates submitted to Edward, and it appeared the war was finally over. But, two years later Robert the Bruce, murdered John Comyn, in Greyfriars church, the pivotal event that led to Scottish independence and consigned the Comyns to the historical dustbin. Robert after numerous setbacks, eventually crushed the Earl of Buchan at Barra, and went on to totally destroy Comyn power. It is somewhat ironic that the Comyn family rose to power by crushing two campaigns, launched from Moray, to seize the Scottish throne, but were themselves destroyed by a third. Also, that the last senior male heir of the family, (John IV) who had for a century defended the Scottish crown should be killed fighting on the English side at Bannockburn. 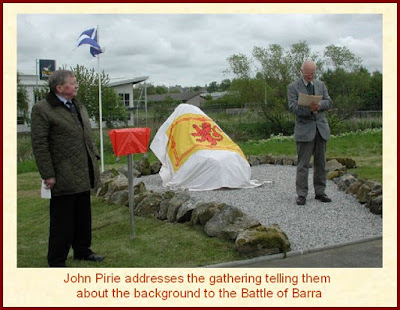 It has been a long time since I posted, but with the 10th anniversary of the unveiling of the Battle of Barra Memorial is coming up, I have decided to close-out the blog and commemorate the anniversary. Between now and the 23rd of May, I plan to clean-up the blog, and make around half a dozen new posts, with the final one on the 23rd May. Historic Scotland has identified the Battle of Barra as worthy of inclusion in their list of battlefield sites, considered to be of national importance. Follow this link for detailed information on process and the purpose of the current inventory. The report gives an outline of the battle and related history, as well as maps showing the boundaries of the site, suggested deployment of the opposing armies, and the location of points of interest. 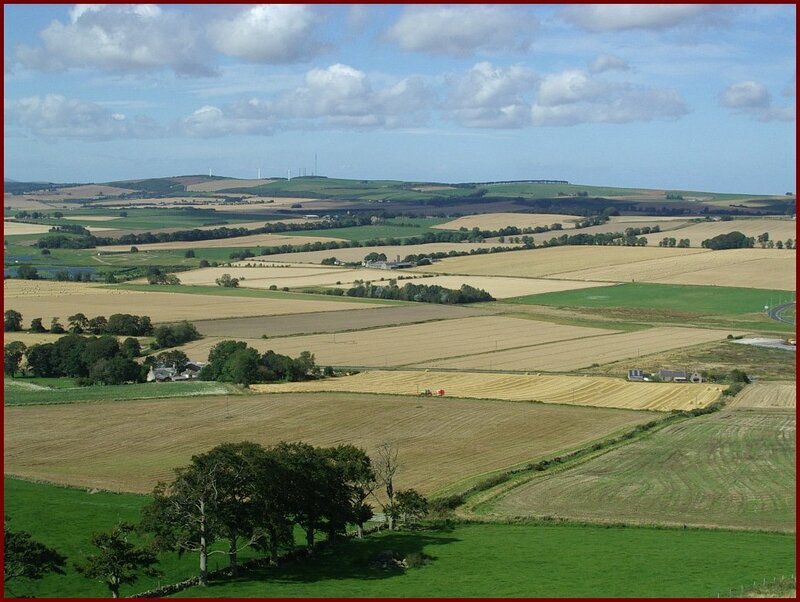 The aim of the reports is to raise awareness of these important sites, so please visit the Historic Scotland site.